The Second Printing of "My Days with Nell" is on the way! WOO HOO! We have been patiently, (well... not me) for it to arrive. I received an email this morning that it will be shipped today! SO EXCITED! Hopefully, we can get it back in the Biltmore House bookstore and to the other wonderful vendors who have been so kind to carry it in their stores in time for Christmas! Can't wait! What a fun morning! I had the pleasure of participating in West Marion Elementary School's Community Helper Day! Mrs. Pat Thompson, first grade teacher, invited me to come and speak to students about my book, "My Days with Nell." I spoke to about 75 to 80 students about Christmas at Biltmore. These smart and well behaved children are going on a field trip to the home of George and Edith Vanderbilt, on December 12, 2013; I hope my visit peaked their excitement for their adventure. It is always nice to visit my "home school." I know so many wonderfully dedicated educators there and it is nice to see them and catch up on what's going on in their lives. Thank you Mrs. Thompson and Mrs. Moody, for the warm welcome and for thinking of me as a Community Helper. Have fun at the Biltmore Estate... the house is decorated for Christmas and is absolutely stunning this year! Remember students... count the trees! See if you can find all 56!!!! I'm so excited! This week a fourth grade teacher, Ms. Tammy Washburn, contacted me to present, "My Days with Nell" to students at Marion Elementary School! I will be visiting grades 2-6 on December 12, 2013. Ms. Washburn's fourth grade classroom will be visiting the Biltmore House on December 17, 2013, and this will be a wonderful opportunity to share my book with them and hopefully, it will peak their interest and excitement for their visit. I will be presenting the North Carolina Common Core Writing Process with the students and how I used this process in writing "My Days with Nell." Then, we will have a question and answer time on all things Biltmore. Visiting elementary schools is an extra bonus for me. 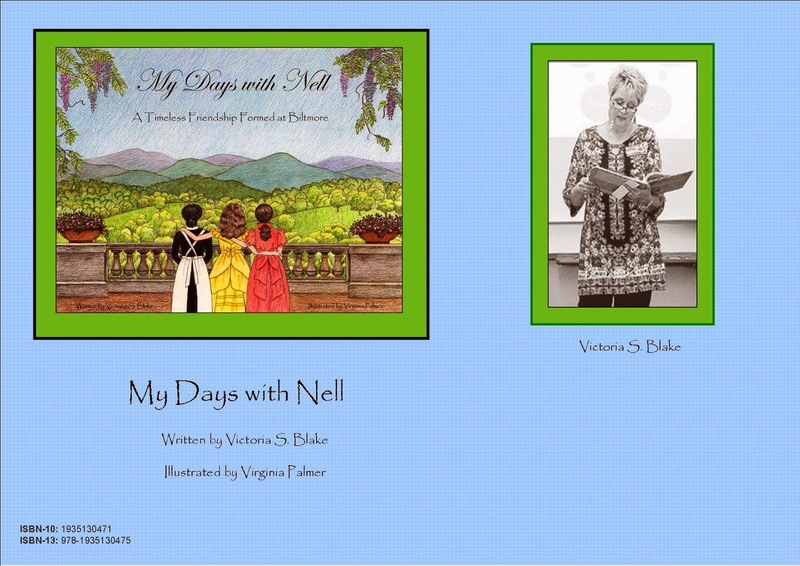 I adore sharing my love for Biltmore with the students.They will have the first opportunity to purchase "My Days with Nell" with the new cover of Nell, Lilly and Ellen Jorith gazing at Mt. Pisgah from the Loggia. I can't wait for my day with Marion Elementary! Thanks to Ms. Washburn for the invitation!! !